Aug 16 - Life has been busy and I now have lots of stuff to write about. My apologies to those who have been checking and there were no updates. But right now, I have built up a stash of items so you should have more than you ever wanted. I am keeping track in one of the lower cells of things I want to update you about. I wouldn't call the list teasers, just reminders for myself. The first thing I want to write about is my Aunt Sandy. 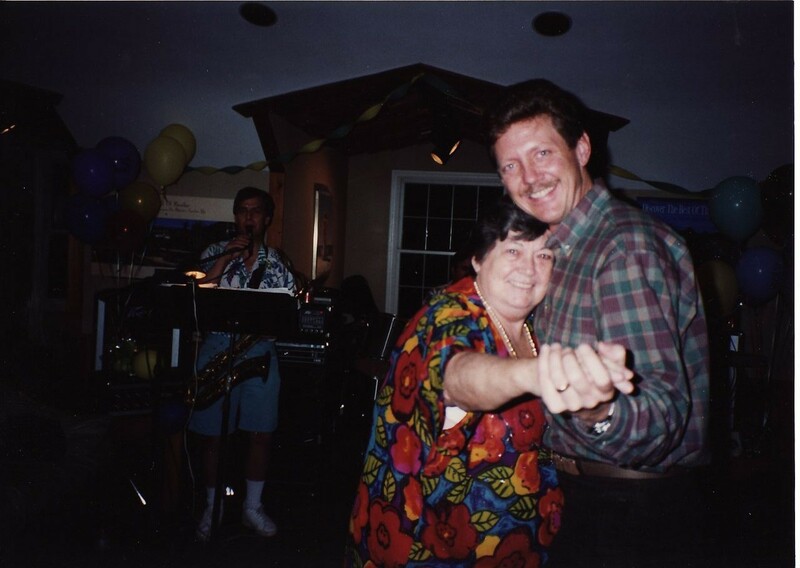 One of the reasons I have been totally consumed with my own life and have had no time I wanted to expend on the website is that my Aunt Sandy is dying. This began quite a while ago evidently but it all really came to surface for us about a month and a half ago. We came up for a visit and Sandy ended up in the emergency room. The first time, they didn't really find something and thought it was an overload of calcium. Deb made a trip up for most of the week and on the Friday she was to return, Sandy went into the emergency room again by ambulance. After a few days, they found that she had pancreatic cancer and it was too far along for anything to be done about it. 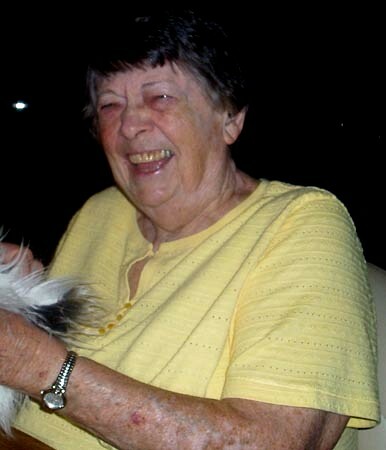 Next decisions had to be made by the family, led by Sandy, as to her care as she went into a hospice program. The decision was made that Sandy would go to Manor Grove in Kirkwood which has turned out to be a very loving place. We have been able to visit off and on during this time and on one particular Tuesday, I drove up leaving at 5:30 a.m. and was able to see her smile at me and then drove back later in the afternoon arriving 45 minutes after our dinghy sank and the engine was put completely under water. Yes, I can fix a dinghy engine but there really is nothing I can do for my Aunt Sandy except to be there when I can and wait for another smile. Today, Sunday Aug 16th, I got just that. Well not a smile exactly but when I was talking about the rain she opened her eyes just a bit as to say, hi. 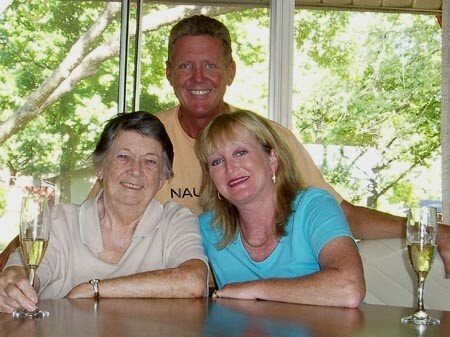 So, I thought what better way to write again on my website than to talk a bit about my Aunt Sandy. The above picture was taken about 2 years ago when we surprised her and she was the first person we saw in St. Louis when we flew back from Norfolk for our annual friends and doctors checkups. This was a great day for us and I know she enjoyed it too. Sandy is one of the first people who taught me about unconditional love. She has always loved me and it really didn't matter if I did good or if I messed up. It simply didn't matter. I really haven't heard her say a negative word to anyone and truly wish I could be more like her when it comes to giving myself to other people. The picture to the left was taken at the Commonwealth Yacht Club in Kentucky the night before we left to go cruising in 2006. She was one of the very important/special people who came to simply say have a great trip and enjoy life! You can probably see the tear in my eye as we said goodbye. Although I have always felt very close to Sandy, while we were cruising we actually grew closer . 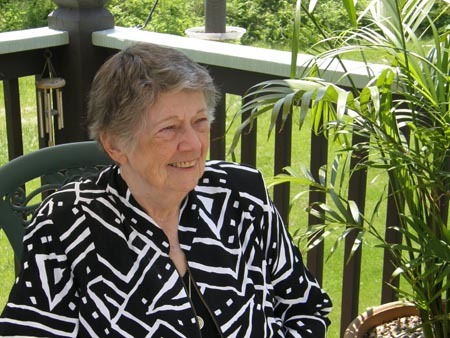 She would read my website everyday and knew our stories better than we did. Our weekly calls on Sunday were always time to catch up further with her. 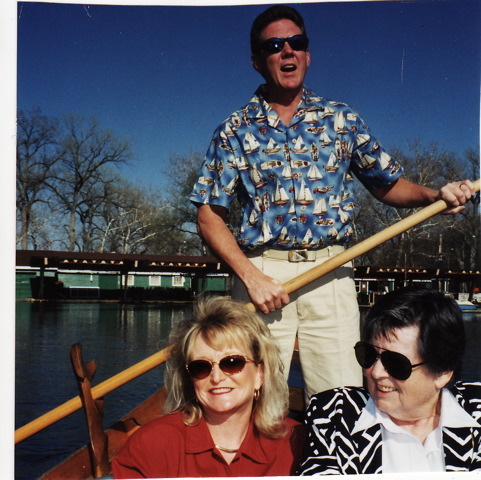 These were moments when Deb and I could tell her a story before it "hit the site" and I know both Deb and I always loved talking to "Aunt Sandy." 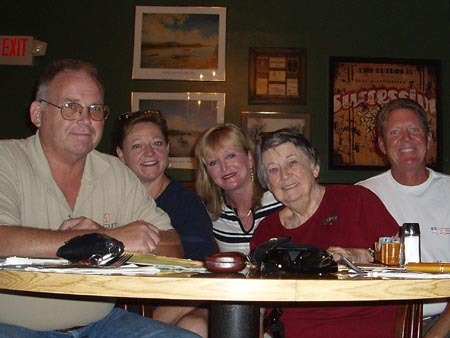 Each time we would come back to St. Louis for our summer catch-up appointments, Sandy, Julie, and Tom were in the mix. But I have to say, I really loved my hugs from Aunt Sandy. This summer it is entirely possible that we ended up coming back to Kentucky Lake just so we could be closer to her in her time of need. As I sit at her bedside right now I know that in a matter of a few days or perhaps a week, she will no longer be with us. All I can really say is that my life has truly been much better for having known and experienced life with her. Thank you Aunt Sandy for allowing me to share life with you. Aug 18 - Sandy passed away this afternoon while Julie was hugging her, I was holding her hand and Tom and Deb were providing support. She wasn't in pain and passed in the way she wanted to. I'm happy we were all there in her final days, hours and minutes. Once again she was teaching me not only how to live life but also a dignified way to pass. I hope I can live my life in a way that others are pleased to call me a friend in the way Sandy has demonstrated. Aug 22 - Some things you would think would be easy. I mean it seems that if you pass the Captains course, there would be forms to fill out and then you would present them to the Coast Guard for your application for the Masters License. It isn't that the Coast Guard is the issue, their information needed is really fairly straight forward although detailed. The issue is everyone else providing you the right information. In my case there were five problems. First was the company I took my courses from only sent me one diploma instead of three. I had to wait almost a month to receive the two missing certified diplomas. That month wasn't wasted however because the State of Missouri also had a problem. I had requested registration information and proof about previous boats I owned. I as very specific with dates, models, addresses and so on. However, they simply didn't provide that information. Instead, they sent me information about a couple of motors that I owned on other boats. So that meant that I had to get back in touch with the State of Missouri, provide them with the information I provided the first time and find someone higher up the ladder to make sure someone actually did what they were supposed to do for the fees I paid them. I ultimately received the proof for two of the other boats I had the most time in and filled out my sea service forms on those boats. I also found out that the agency who filled out my TWIC card (background check to make sure I'm not a terrorist) didn't check the right box showing I am a merchant mariner even though we wrote and told them that is what we were when completing the fingerprints and paying for the security check. I was able to get that changed and even have a ticket number showing it was changed. And of course there is the physical we are required to take and pay for. The nurse didn't check that my hearing was normal but I found that out before submitting the forms so I was able to go back to the office and have them check the box. The second problem surfaced when I went in for my appointment with the Coast Guard to submit all the forms. That is when I found out that the doctor didn't fill out a block on the form so instead of having them submit the incomplete form, which they were going to do, I suggested that I take the form back to the doctors office and they complete the box and I mail it to the Coast Guard and they could then send the information up to Virginia where it will all be processed, analyzed, and I'm sure they will find something else wrong. The bottom line is that by tomorrow, Monday, everything should be to the St. Louis office and hopefully we will move forward albeit a month behind. Of course I still have to wait to take the sailing endorsement because they have to give me permission to take the test at the regional exam center in St. Louis. Hopefully, we will get that permission in the next month so all we need to wait for is the arrival of the license. This may sound like whining and perhaps it is a bit. I just hope we finish the process before I have to take a refresher course because the five year renewal comes up and I still don't have the original license. On a more interesting note, we are listing and selling boats at Kentucky Lake. I have two boat surveys scheduled for this week along with sea trials. In addition, we are working with several people to list their boats which I need badly because we have more people interested in buying and we don't have their perfect boat yet. I'll be writing more about the boat business in my next update. Boats listed and sold, Lessons learned in yacht sales, Our uncertain future - we just don't know where we are going but we do know where we've been.